I saw my first August Wilson play earlier this year, Penumbra Theatre's production of Ma Rainey's Black Bottom at the Guthrie. 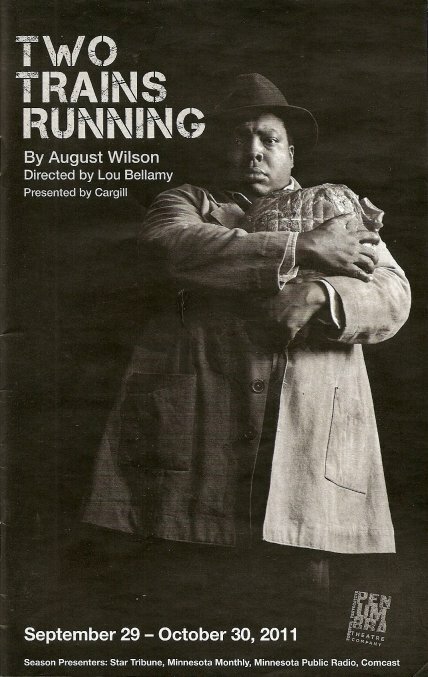 I was so affected by it that I now have a goal to see all of the plays in Wilson's ten-play cycle, each one covering the African American experience in a different decade in the 20th century. Lucky for me I live here, where the Penumbra Theatre in St. Paul has produced more August Wilson plays than any other theater in the country. So it's pretty likely that I'll meet my goal in the next ten years or so. Ma Rainey is set in the 1920s, and Two Trains Running is set in the 1960s. It has a little more of a happy ending that what I remember from Ma Rainey, which has a pretty bleak outlook. This play takes place in a fading restaurant in Pittsburgh in 1969. The city wants to buy it from the owner, Memphis, and he's determined to set his own price. The play's characters are the locals who frequent the restaurant (played by many of the same actors I saw in Ma Rainey). They play the numbers in hopes of a way out, drink coffee, argue with each other, and visit "Aunt Edna," a woman who claims she's over 300 years old and can predict the future. James Craven (who still sounds like Tommy Lee Jones) is Memphis and has a couple of great moments, including a drunken celebratory scene. Memphis' land was taken away from him in the South, so he moved north to make a better life for himself. He has, but still thinks about going home. Crystal Fox, the only woman in the cast, plays the unappreciated waitress Risa. She drags her heels slowly around the stage, pouring coffee, wiping down tables, and refilling the sugar. Her weariness with life is evident in every word, expression, and movement, until she finds something to hope for. Namely, the newcomer Sterling (James T. Alfred), who's just been released from prison and is restlessly looking for a job or something to occupy his time and energy. Wolf (Kevin D. West) uses the restaurant as an office for his business running numbers and tries to get Risa's attention, but she's not interested. West (Dennis W. Spears) is the rich man in town who owns the funeral home as well as many businesses, and has been trying to buy Memphis out for years. Abdul Salaam El Razzac is the regular Holloway, who seems like he's been coming in, sitting at the same table, and eating the same food for years. And then there's the man called Hambone because every day for ten years he demands the ham that was promised him in payment, and never gets it. Ahanti Young, who was so great as Ma Rainey's stuttering nephew, again plays someone who doesn't quite fit in with such tenderness and dignity. All of these characters are so beautifully created and lived in by these actors. The set looked real and lived in too; I wanted to pull up a chair and order some macaroni and cheese. By the end of the play, Memphis gets his price, Sterling and Risa attend a rally for Malcolm X, and Hambone gets his ham. Things are changing, the neighborhood is dying, but there's hope for the future. Although I've seen a few Penumbra productions at the Guthrie, this was my first time at their theater near Selby and Dale in St. Paul. It's a great space (it feels fresh and modern with great artwork on the walls) in a great location (close to the freeway with lots of nearby restaurants). Here's an easy equation to remember: August Wilson + Penumbra Theatre = great theater not to be missed. I look forward to the next one.